When you have an in-service failure of an underground primary cable, the main goal is to restore your customers’ power as soon as possible. Fault locating requires more than just a thumper. Efficient fault location requires the convergence of knowledge, methodology, and the right hardware. A comprehensive approach is needed to get the job done quickly, minimizing customer outage time and damage to the cable system. 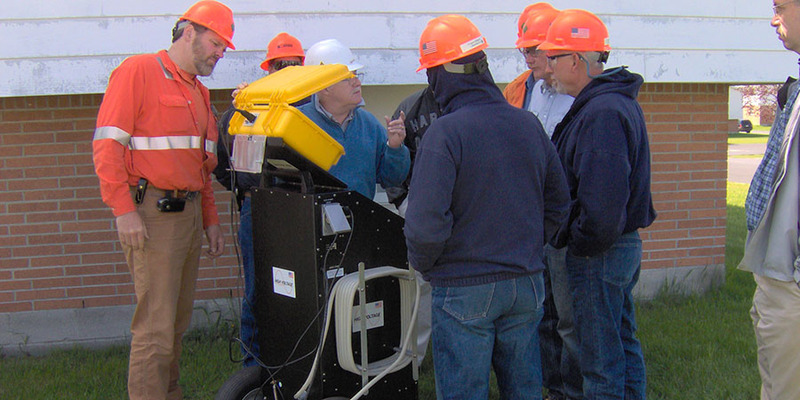 This includes knowledge of the cable systems design, construction, history, accurate maps, proper fault locating procedures, the right thumper, some cable burn down method, use of TDR/radar, and a top level acoustical and electromagnetic listening device. HVI’s CDS Series cable fault locators are all full-featured with controlled energy, unipolar design, 3-range hipot, 3-range impulse, burn capability, TDR-ready for both arc reflection and current pulse methods. These thumpers are equally qualified for use on standard URD to network systems. HVI also offers the world’s only VLF/Thumper combination—the VT33 is designed for complete care of 5-25 kV cable. With the SKD Series, HVI will custom design and mount all the tools needed for testing cable systems onto a skid, including thumper, radar, listening device, VLF, tan delta bridge, and cable reel for simple installation into a truck, van, or trailer. HVI offers the 1669 Time Domain Reflectometer (TDR), the SDAD acoustic and ballistic listening device, and the X35 Electromagnetic Field Analyzer as well as other accessories to round out our offerings.